in 1972, yes' drummer bill bruford announced that, despite the roaring success of the album close to the edge, he was leaving the group for pastures new. granted, he was about to fill the drum chair with king crimson, but they weren't exactly poised for commercial success at the time. add to that the well-known brusqueness of crimson founder and guitarist, robert fripp, and bruford was hardly about to rest upon his laurels and enjoy the wealth and comfort afforded by his efforts with yes. three years later, having achieved what seemed like the breakthrough they had striven for, genesis embarked on a lengthy tour with 'the lamb lies down on broadway' a double album that all but guaranteed their place in rock's pantheon. but prior to commencing that tour, singer peter gabriel had told the rest of the band that he was leaving to carve a solo career. once again, when financial success had apparently been realised and a previously unknown degree of comfort beckoned, another individual was voluntarily throwing himself on the mercies and potential hardships of the world. admittedly neither of the above musicians were fledglings at their art, having quite comprehensively laid out their respective curriculum vitae for all to see. both were presumably confident that they would not be left flailing on the periphery, unemployed and unemployable. add to that, there would be a smidgeon of royalties to keep them cosy in their beds at night, but one can't help admiring them for making such seemingly unwarranted leaps of faith. those of us who are not of that ilk generally tend to spend the bulk of our careers trying to do quite the opposite. life rests upon finding a job that we like, that pays enough to keep the wolf from the door and allows a few bob extra for the occasional trinket. we surround ourselves with stuff we probably don't really need with the end result of making ourselves comfortable and happy. it is seemingly the western way, and most of us are content with the flow. having achieved cosy, it becomes a very happy place to be. in the hebrides at least, we are on the cusp of the fold between autumn and winter, making it pretty darned difficult to clothe oneself appropriately; despite awaking to clear blue skies only the other morning, by the time the cielo was wrested from its slumber in the bikeshed, the blue had been overlaid with grey fluffy matter and precipitation was flowing freely. the showers pass rainjacket that had been unceremoniously stuffed in a back pocket did not stay there for long, and in what had seemed like over-protective folly at the time, both hands were safely clothed in a pair of their outdry crosspoint softshell gloves. 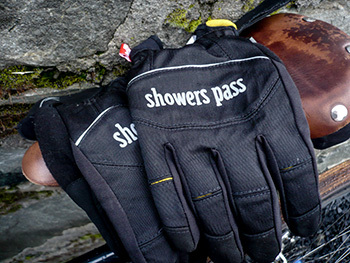 showers pass set out their waterproof stall in portland, oregon in 1997. named after showers pass road in northwest california, perhaps eccentrically or even knowingly, they concentrate entirely on waterproof, breathable clothing including jackets, trousers, vests and one or two accessories. 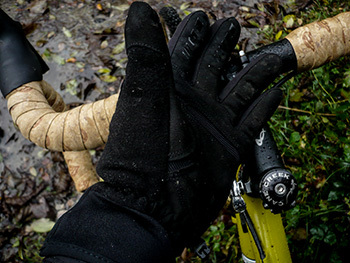 and as of the beginning of this year, they introduced the crosspoint range of gloves ranging from a liner glove and windproof glove to both the softshell waterproof under review and topped out by their hardshell, merino lined edition. i have come to note, from astute observation, that i rather enjoy being cosy at this time of year, even if that cosiness errs on the side of being a tad too warm. this is of great concern, because i would rather identify myself with messrs. bruford and gabriel, ready and willing to make that leap to obscurity by dressing in the bare minimum that the climate demands. though ben lieberson may be correct in his assertion that outside is free, i'm happier to be free when wrapped against the elements. 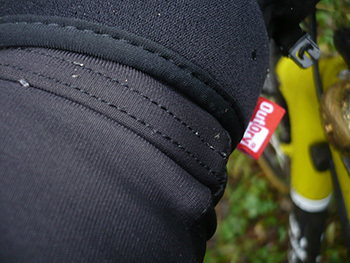 and that's precisely where a pair of outdry softshell gloves enter stage right. 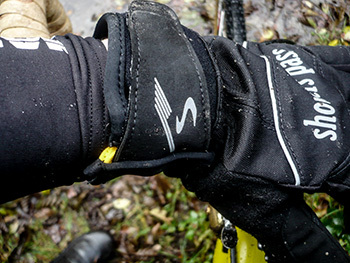 the outdry technology is part and parcel of the softshell's ability to keep rain, wind and hail at bay while keeping those little handies cosy, warm and able to brake and shift gear under duress. it's an internally fitted membrane bonded to the outer fabric and fending off ingress of rain away from four fingers and a thumb. to date, i have spent close to a total of seven hours in persistent rain of differing fortitude without so much as a dribble of water gaining access to the innards of these gloves. a depressing proportion of those hours have been enjoyed, thumping into near galeforce winds, a situation guaranteed to find any weaknesses in their cloaking device or force field. the overall fit is quite impressive, aided by a velcro strap at the cuff to prevent the elenments from sneaking in through the back door. 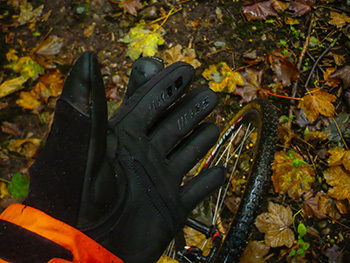 it's worth my pointing out, however, that while i would more regularly be a size medium in cycling gloves, the softshells reviewed were a showers pass large. check your size before purchase. though classed as breathable, that part of the equation is less impressive, but at the risk of repeating myself, you probably knew that already. there are very few items of apparel in the cycling firmament that offer a level of breathability commensurate with the efforts expended by the flailing velocipedinist. in mitigation, the ambient temperature has, so far, been still in the mid teens, likely a smidgeon higher than showers pass had in mind when designing the outdry softshells in the first place. however, if i might return to my earlier narrative, even that level of cosiness is one that i am more than happy to embrace. on a couple of those wet and windy outings, while on the return home or to coffee, though with hands clothed in at least marginal perspiration, i confess to experiencing comfort and joy. there is no shame in riding with a self-satisfied grin on the visage, safe in the knowledge that should any misfortune in the shape of a mechanical or crevaison rear its ugly head, guess whose going to award himself brownie points? the crosspoint softshells are sturdily made, stylish enough to be worn with anything, superbly padded, grippy and yet flexible where they need to be, possessed of soft and fluffy stuff in the right places if your nose needs wiped and at a price point that won't have you dithering over whether or not to purchase. the ideal handwear when close to the edge.